SNES Mickey no Tokyo Disneyland Daibouken (JPN) in 20:35.46 by arandomgameTASer. Mickey no Tokyo Disneyland Daibouken (ミッキーの東京ディズニーランド大冒険) (or "Mickey's Great Adventure in Tokyo Disneyland") is a Japan-exclusive Mickey game, but with a completely unique graphical and gameplay style compared to other Mickey games on the SNES. 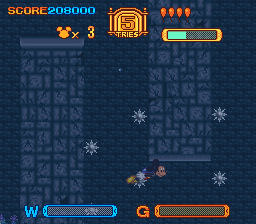 This one has balloons, and a propulsion mechanic similar to the likes of Sparkster and Twinbee. arandomgameTASer improves his old run by 1:02.86, thanks to better optimisation.